A Leadership Development Program that Elicits Unprecedented Career Engagement. Are you looking to increase employee engagement? Are you looking to connect with diverse professional women? The RSM Signature Event is known for the number of “aha” moments it provokes and is recognized as one of the best women empowerment events. Who is drawn to participate at these leadership development programs? Myriads of multicultural professional women and men from high potentials to high achievers. The RSM Signature Event is a highly engaging, experiential program that ignites participants’ sense of purpose and sets them on a path to career success. How? By awakening the need for self-discovery and encouraging the alignment between their own interests and their career goals. The shortest road to career acceleration! 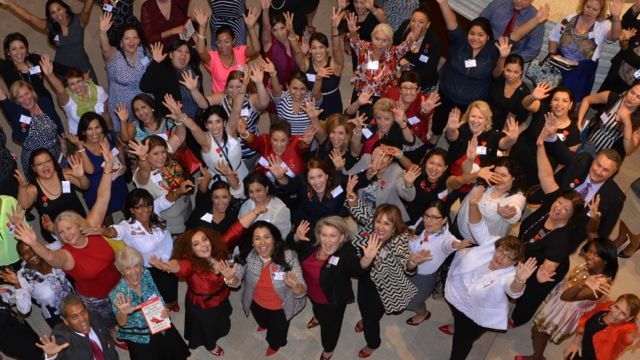 Your company can be part of the excitement unleashed by the Red Shoe Movement (RSM) leadership development platform by sponsoring an event, or by purchasing ticket packages for your employees. Kick start a robust women’s initiative in your organization with this unparalleled leadership development program! A highly sought-after event, a smart combination of networking and RSM Circles, the RSM Signature Event is unlike most leadership development programs you may know or have participated in. Yes, I’m interested! I need more info to consider sponsorship! A four-hour event packed with women empowerment activities, experiential learning and leadership development opportunities. I’m in! Send me info to sponsor it! We can customize the right level of sponsorship for you or purchase a Ticket Package to send a group of your women employees to this effective leadership development program. I’d like to know more about my options! If you’re looking to bring the excitement of the RSM Signature Event to your employees and customers, send us an email and we will be happy to discuss options for sponsoring this women empowerment program.